Today we are finally showing the boys some love on LVS! Please welcome this week's guest host, Gabrielle. 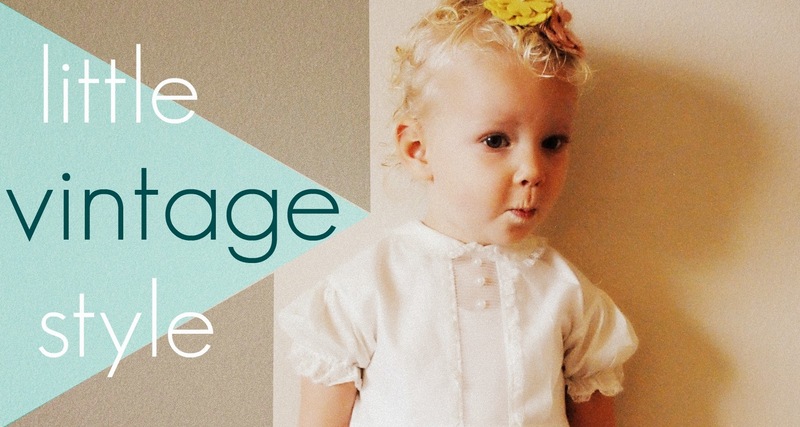 Her whole family has fantastic vintage style, but today she is sharing tips on dressing little boys in vintage. We all know vintage boy clothing is harder to come by, so any of you mamas with little boys - this is a must read! Hello Hart & Sew readers, I'm Gabrielle and I'm very happy to be guest hosting today all the way from Auckland, New Zealand where I live with my little vintage loving family. Miss Isabella (16yrs) wears 100% vintage all the time, but it would be fair to say that on any given day we will all be wearing at least one item that is vintage, thrifted, a hand-me-down, or handmade using vintage or thrifted fabrics. Part of the reason is that we try as a family to live as eco-friendly and sustainably as we can, but a big part is that we just love the vintage aesthetic. 1. Basics...I find the older the boys get the harder it is to find an entire vintage outfit so I have some chain store basics that seem to look good with a vintage item. Skinny jeans, 70's style flares and shorts that have that English school boy look- think Edwin in the Lion the Witch and the Wardrobe - all look great with vintage shirts and jerseys. For Arlo my No.1 basic is tights, they look great under shorts with a little vintage shirt or tunic, especially sailor tops and also make a great extra layer under thinner overalls. 2. Handmade and Upcycled...Vintage patterns are something I find a a lot of while thrifting, and using either thrifted vintage fabric or men's clothes I make lots of pants and shirts for the boys. Vintage patterns can be a little trickier to follow as they come with very few instructions compared to modern patterns, my thoughts are that it was assumed at the time they were printed that women knew all the sewing terms and how to apply them to a garment. Two modern patterns that are great for creating vintage look clothes are the Slim Slack pattern from This Mama Makes Stuff and Dana from Made's pants pattern. You can cut Dana's pattern from a pair of men's vintage pants using the existing hem and they look great. With shirts you can place a vintage pattern on a men's shirt and use the existing button placard and sleeve hems. 3. Woollens and Hand-knits....these always lend a vintage vibe to an outfit, we are lucky enough to have Grans and Aunts who knit for us as well as hand-knits being another thing I often find while thrifting - it might be something to do with the large number of sheep in New Zealand. One of my favourite looks is a vintage styled vest over a vintage shirt. 4. Accessorise... just as our Grandmothers would not have left the house without the right hat, gloves, shoes and bag I find vintage accessories complete the look for the boys. Fedoras, berets, newsboy caps and knitted aviator helmets all look great. A good vintage wool coat is something I have paid a little more for in various sizes from Etsy or online auction sites. Suspenders and ties are two more favourite items, men's ties on neck elastic can be tightened and look cool with a vintage or retro styled shirt and skinny jeans. Lastly shoes...I have to admit the boys have as many pairs as the girls did at the same age. Boots always funk up an outfit, biker, riding or cowboy styles as do thrifted cons or vans. Thanks Stacy for having me over here today to share a little bit about Billy and Arlo's style and I look forward to checking out everyone else's vintage looks this week too! Such a cute family! I love all those hats. And so true on how much harder it is to find vintage boy clothes. Those boys have always got the coolest clothes! I don't think my boys are cool enough to pull off those looks, and their dad wouldn't even let me try it! I'm just lucky I've got a little girl I can gussy up! Wow! I'm in love. 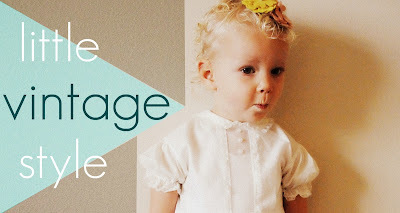 This style is stinkin' cute! I also love her boys' curly hair! Such amazing vintage style! I can't get over how great those little native american appliqued jeans are! These boys are amazingly styled..I'm always impressed with how the whole family pulls these looks together. Bravo! Gabrielle I am always in awe of the amazing things you find for your boys. They always look so cute rockin' their vintage gear. Thanks for the great tips.